So I just upgrade from zesty zapus to artful aardvark. 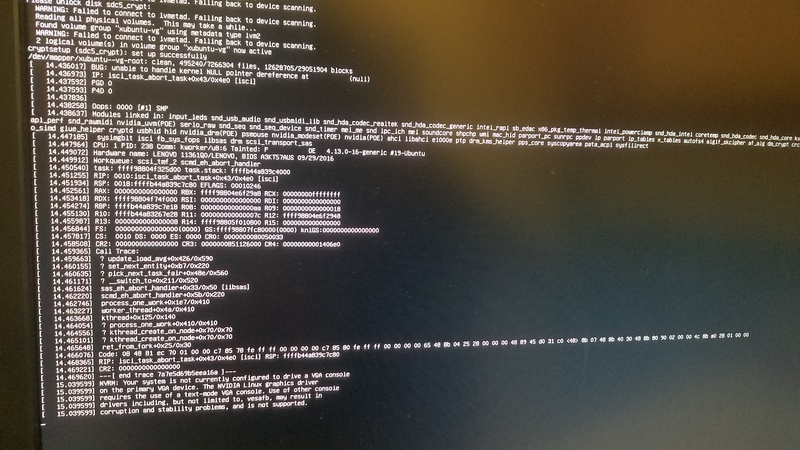 At boot, right after I enter my drive encryption password, it kernel panics with the above message. It doesn't even get far enough along in the boot process for syslog to log this panic, so the only info I have is a photo of the panic. In short, I can't boot using the latest artful aardvark kernel, and I have to boot with the latest zesty zapus kernel. I expect this isn't normal and I should be able to boot with the new kernel, which I can't. So I installed the mainline kernel, and the same issue happened. I couldn't get a picture as it was truncated due to resolution being lowered during boot. Will do. This is my work computer so it may take me a day or so to complete this. I lied. Just was able to get this testing in. That most recent one seems to be the culprit, hit the same panic. Just to verify, I did go back and try the 4.14 kernel again, and the panic still occurs on the fresh install. Thanks for the info and the bisect work, Stefan! With this test kernel, you need to install both the linux-image and linux-image-extra .deb packages. I'm not using ubuntu ;-) just found this report using google. So i can't test - this must be done by Brendan (lostincynicism). 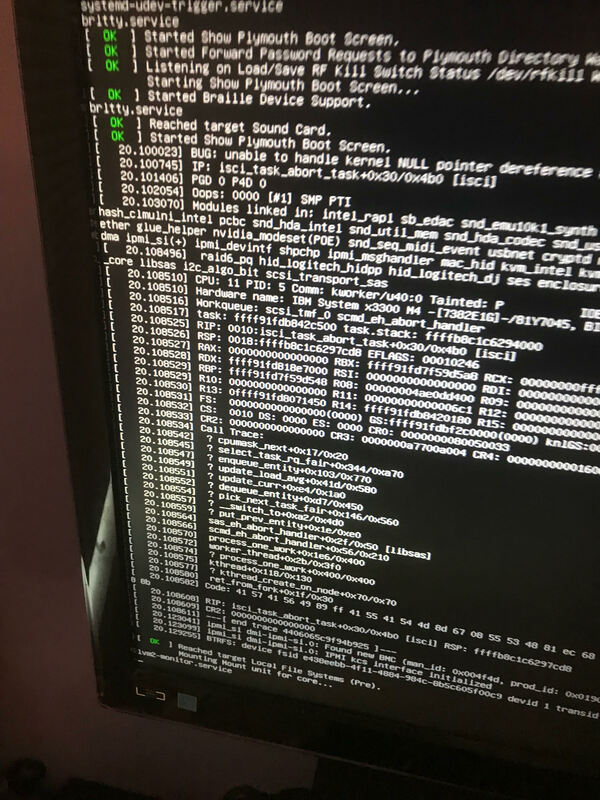 I'm affected by this too - using Proxmox 5.1 which uses Ubuntu's kernel. If could get / compile the ZFS modules for 4.14, I could test kernels. Let me see if I can track those down, or build them myself. Comment #40 was message sent upstream. i have the same issue. 4.13.0-17 always this oops on boot. i had 4.10.0-32 still on disk and this is what i'm using for now. otherwise, reverting the buggy commit seems to solve the issue as well as a temporary measure. This bug and bug 1742630 are probably duplicates. Thanks for all your support, Joseph. I plan to donate to Ubuntu as a result of your continued support on this issue.